It's fair to say Hop Nation was one of the Aussie breweries that was ahead of the curve when it comes to the New England style IPAs that have been all the rage over the past 12 months. While not tagged as such, their original Chop IPA had NEIPA-esque qualities and they've revisited the much debated style many times since, most notably with Jedi Juice. 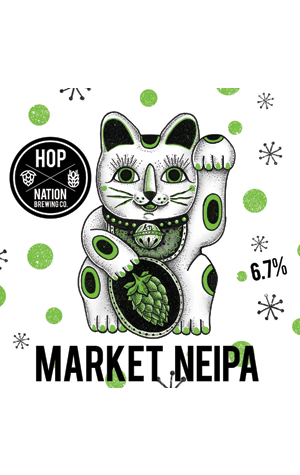 And now they're back with another, Market NEIPA, created for the Hop Quest event at Beer DeLuxe on Australia Day. As with a few beers we've approached in the past, it would have paid to actually read the email from the brewery before we cracked the sample they sent us. Why? Well, the beer certainly looked the goods: deeply hazy and pale golden. And there was plenty in the way of juicy hops (they used Citra, Simcoa, Mosaic and Ella) on the nose too. But... there was something savoury and spicy in there too and the finish was leaner, sharper, bitier than we'd expected, especially from a brewery as accomplished with such beers. "Inspired by the flavours and aromas of the Footscray Market, this hazy, juicy IPA starts hoppy, big and bold before the journey through the subtle flavours of the markets begin. Kaffir lime leaf, mango, coriander, Vietnamese mint and subtle chilli..."
So there you go. As a result, Market NEIPA – originally brewed with the Brunswick Beer Collective – is perhaps best described as a beer and food pairing without the food, a pairing that opts for contrasting and cutting through the juicy fruits and voluptuousness with spice and heat.